From the creator’s Kickstarter appeal: “The Mine Kafon is a low-cost wind-powered mine detonator with the appearance of a giant, spiky-armed tumbleweed. Currently it is at a prototype stage and with your support we will turn it into a reality”. – Let’s hope not. The same thing goes for landmine clearance. From time to time I see really bad ideas that well-meaning people have to clear landmines more cheaply than is being done currently. I posted a few months ago about a landmine detection app for the iPhone as just one example of a really bad idea. Landmine clearance done to UN standards is a painfully meticulous process involving highly-trained professionals working in often grueling conditions. The work is tedious not just because it is dangerous. It is tedious because at the end of the day. the organization responsible for clearing the land is making a promise to the people soon to live there that the land is safe. No such promise can be made without adhering to internationally recognized standards. You can’t cut corners on this stuff. I have been seeing a LOT of a new entry into the Really Bad Idea For Clearing Landmines Department. It has been described as a tumbleweed with pressure plates. 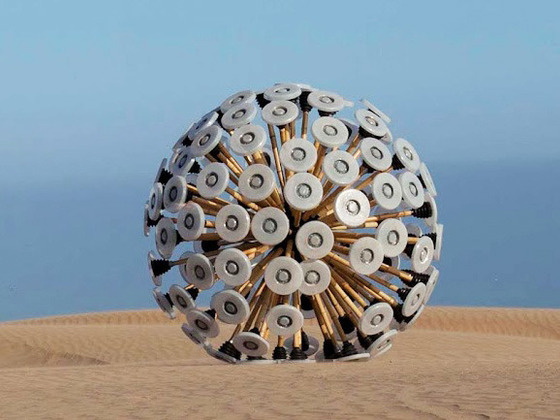 The device gets randomly blown around a minefield by the wind and detonates mines as it goes. It is a beautiful work of art, and no wonder, it was developed by the otherwise brilliant designer Massoud Hassani. It is lovely to look at, but in no way would I ever want my family to live on land that has been deemed safe by using by this device. I have read many articles on this device and have even watched the Ted talk, but nowhere have I seen anyone voicing any skepticism or any demining experts interviewed. An EOD unit in Holland, where the inventor of this tool lives, tested the Mine Kafon and claimed it was “not suitable for mine clearance“. As I have said on this blog before before, real-life situations are much different than the ideal lab or simulated environments where gizmos like Hassani’s invention are developed. This beautiful, bamboo gadget is ultimately dangerous and has no practical application in the real world. [The Mine Kafon is] completely unsystematic, so you don’t know where it has or hasn’t been, let alone what it’s done. It would also fail to set off many mines since – by their nature – the most problematic are hidden in ruts or potholes, around vegatation, edges of ditches etc. Minefields are not golf courses; if they were, clearance would be a whole lot easier. Different mines also respond to different pressures and pressure durations. With most of these devices, it is ok just to ignore the whole thing and it goes away. Now, though, the inventor (along with a filmmaker who gets a cut of the action) has started a Kickstarter campaign to raise money to help develop more of his large-scale toy (his words) for hopeful use in the field. So far he has raised nearly $115,000.00 towards his goal of NEARLY $165,000.00. I promise you, if you give money to developing this tool, it will never clear a single acre where people will live without injury or death from landmines as a result. If you want to give money to clear mines, give your money to one of the organizations, below. You say it is a terrible idea but not once do you give specifics. I’m not agreeing or disagreeing with you i’d just like to know the basis for you assertions. Outside of the fact that it is unguided (which i doubt it’s an insurmountable problem) I can’t,at first glance, see other problems with it. So please enlighten us. From an engineering stand point I would have to say that the biggest flaw would be that it is shaped like a ball. A ball only touches down to the ground one tiny point at a time. This would be highly inefficient at clearing anything more than a fine line. James, you need to explain that for a field to be “cleared”, all the mines must be removed or detonated. And then explain that this device might find a few mines but it will lead people to believe the field is cleared when it is not. Hence, people will be hurt or killed as a result of using this device. Hi Frank, I led the first team to train Afghan deminers ((1989) as the Russians departed and have been working in humanitarian mine action ever since. There are so many reasons why this device is hopeless that it’s hard to know where to start. Primarily, it’s completely unsystematic, so you don’t know where it has or hasn’t been, let alone what it’s done. It would also fail to set off many mines since – by their nature – the most problematic are hidden in ruts or potholes, around vegatation, edges of ditches etc. Minefields are not golf courses; if they were, clearance would be a whole lot easier. Different mines also respond to different pressures and pressure durations. – The designer (according to his own words) grew up playing in mine-strewn areas. So it’s not just a lab space fabrication. – There is on-board GPS and sensors, so tracking where the thing has been is indeed possible. – The original article above focuses on ‘mine clearance to UN standards’. That kind of clearance is awesome, of course. However, what if you don’t have the money for that level, AND your kids are playing in the mine field anyway? That said, this kind of criticism is a good thing. I want to be sure that we’re talking about a device that actually does the good it promises, does not fail in real-life situations, and isn’t a prettily designed media hype. At this point, I’m not ready to write off the Kafon though. This is a brilliant analysis, Matt… your model also assumes ideal conditions (almost like a golf course, I assume) and still the Kaffon is ultimately ineffective. Thanks for posting this. Very, very interesting! !